We’re closing in on the end of November, which means that WBHQ is taking some time away from the office to stuff ourselves with turkey, green beans, pumpkin pie, and sweet potatoes! What does that mean for the WallaCommunity? Beginning now, enjoy a weekend sale with a brand new personalized Player Unique opportunity! Enjoy 30% off honeycombs, locks, pouch upgrades, and mixer packs from the online store! *NEW* limited personalized Player Unique! You thought Mr. Potato Head was all the craze? Get ready for Señor/Señorita Sweet Potato! 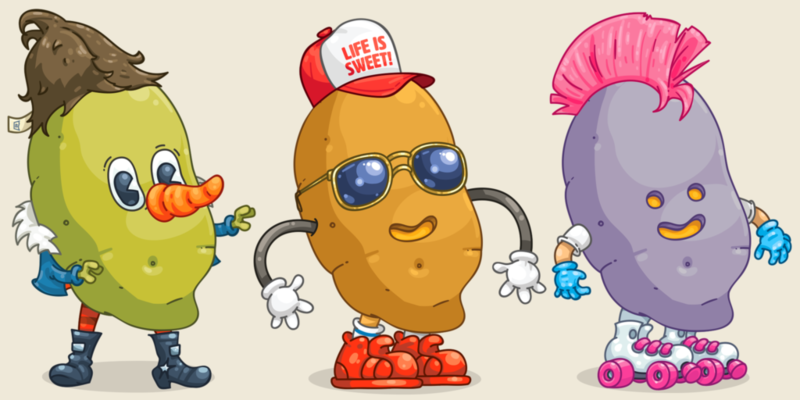 Choose your sweet potato’s look with accessories from various characters you know and love! Want the arms of Sarah Jurassica Parka? You’ve got it! How about sweet aviator shades? Done! What about a pink mohawk? We’ve got you covered! There are over 50 different accessories and more than 120,000 possible combinations to choose from! This personalized Player Unique is a limited time opportunity and will only be available on the above dates, so get it while it’s hot! Unique ownership is nontransferable between accounts. You will have all distributive rights to your Unique once it is added to your account, with exception of offering it through Foraging, Uncanny Uniques, and/or Market resale. There is no cap to how many you can distribute. This offer is specifically for a personalized Unique, not a custom Unique commission. Alterations to the design of the Unique are not available outside of the available options to choose from which we have provided. This entry was posted in Announcements, Game News on November 21, 2018 by WallaBee. Copyright © 2019 Freeze Tag, Inc.